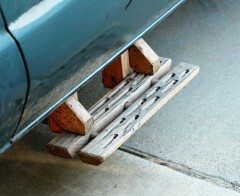 I wanted running boards for the van, but couldn't justify the hundreds of dollars for professional metal ones, so I made a set out of left-over 2x3 lumber. Including labor, they probably cost four times as much, but this way the van is unique! 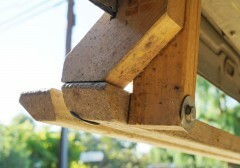 The outer board is held on by glue on the exposed dowels. 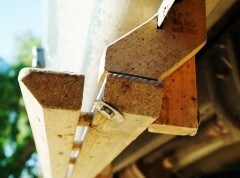 The back is braced by gussets to the vertical supports which is connected to the body flange, all held together by lag bolts. The support and the gusset are glued together. A few months after installing them, my wife hit a curb and busted up the long side, so I repaired it. Another advantage of working in wood, it doesn't break your car when you hit something, and you can fix it with some wood glue!